What is orthognathic surgery? Diet Soda vs. Regular Soda: Which is better for teeth? Flossing: Braces can make flossing a chore, but it’s an essential adjunct to proper tooth brushing. Make sure to floss between all your teeth and brackets. Dr. Joshua Beeler can provide you with braces floss threaders and interproximal toothbrushes (small brushes used to clean areas under wires and between brackets) to make the task easier. You might also consider purchasing an oral irrigator that uses a stream of water to blast food particles and debris from between teeth and gums. 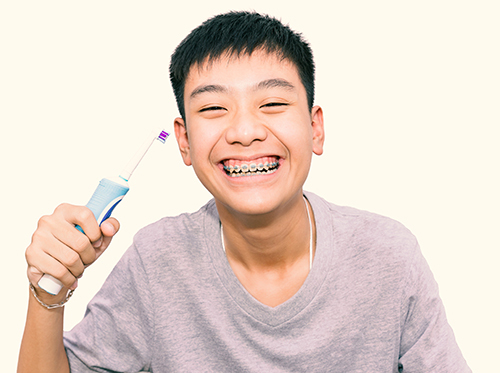 It's vital to keep your teeth and gums clean during your braces treatment, and that requires your care and attention. If feel like you need help with any of the techniques above, a member of our Show Low, AZ team can demonstrate them for you!